This morning it was wet again. We expected as much so we erected our tent last night to avoid getting wet. The wet was again due to sea fog drifting in. The locals say the fog comes with clockwork regularity during the first week of August every year and it’s the signal for the grey nomads and caravanners to pack up and go home or at least go south. The fog signals the end of the dry season and the start of the wet. Today we ran into a storm, the first rain since Anzac Day when we were at Daly Waters during Leg 1 of our odyssey. 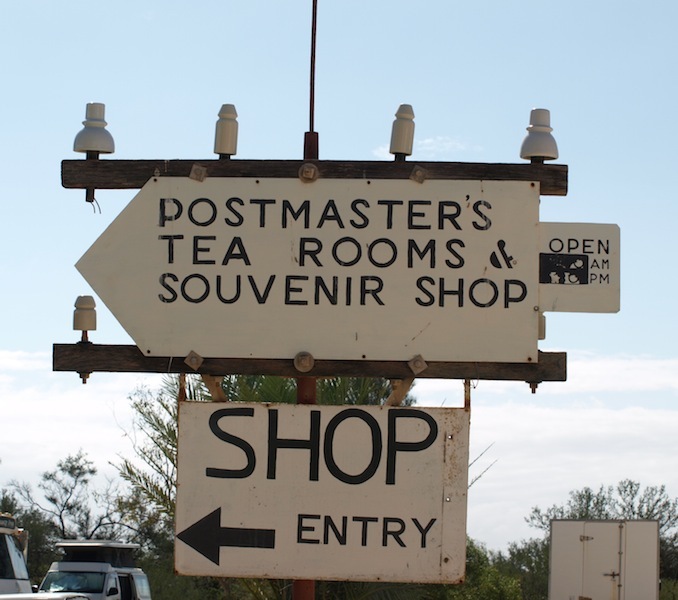 The first activity for the day was to buy a shower at the Overlander Roadhouse. It cost $5 each, which in light of the hot water running out was robbery. 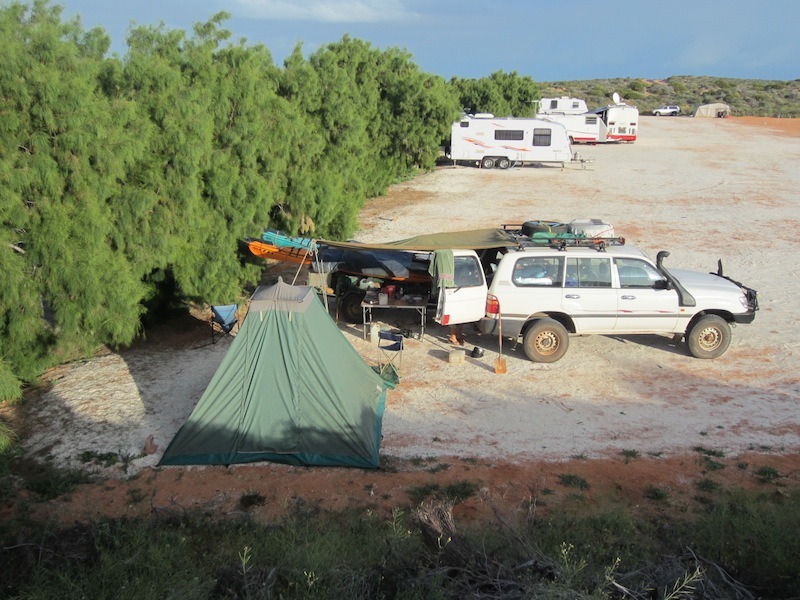 From the roadhouse we headed into Shark Bay country where the shire has established a number of free camping areas along the coast. We called into a couple but it was blowing a gale and it would not have been very comfortable so we went on to Denham and booked into a caravan park. 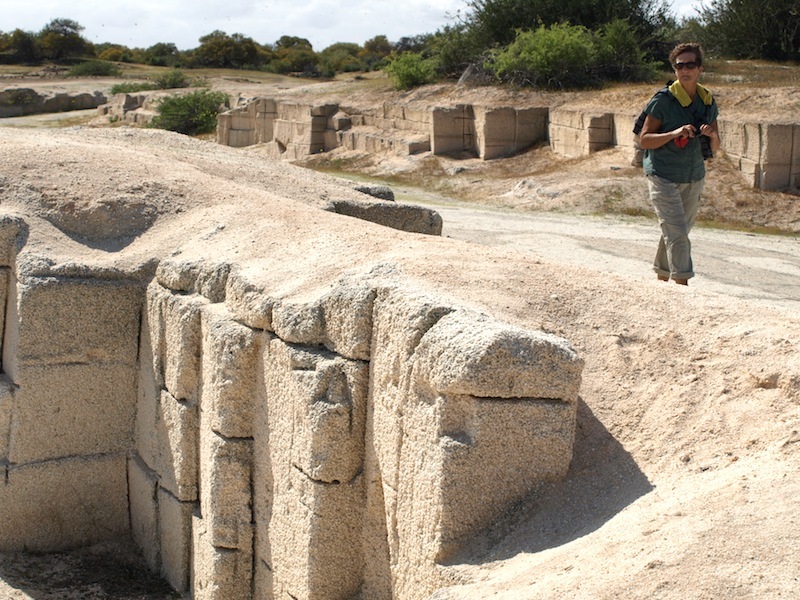 Denham is a small town located 833km north of Perth on the Francois Peron Peninsula. 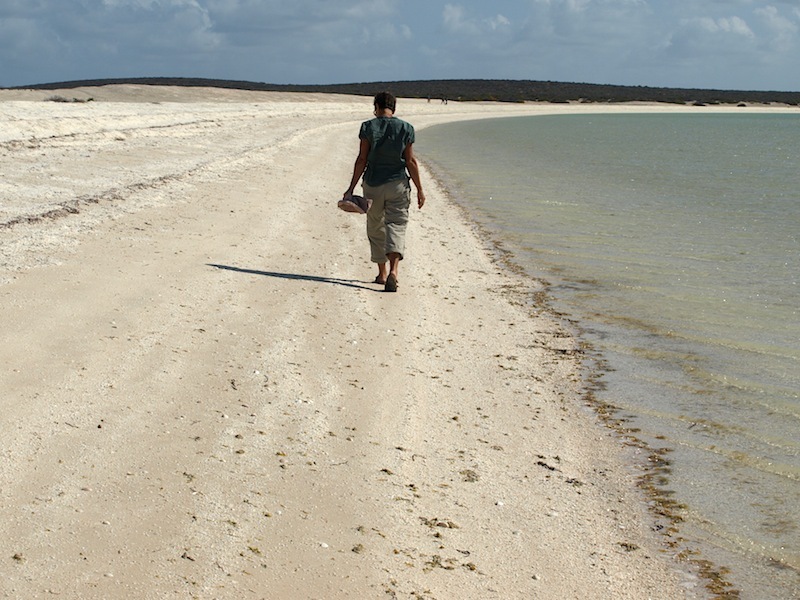 It is the main settlement of the Shark Bay area on the West Australian Coral Coast and Australia’s most westerly town. 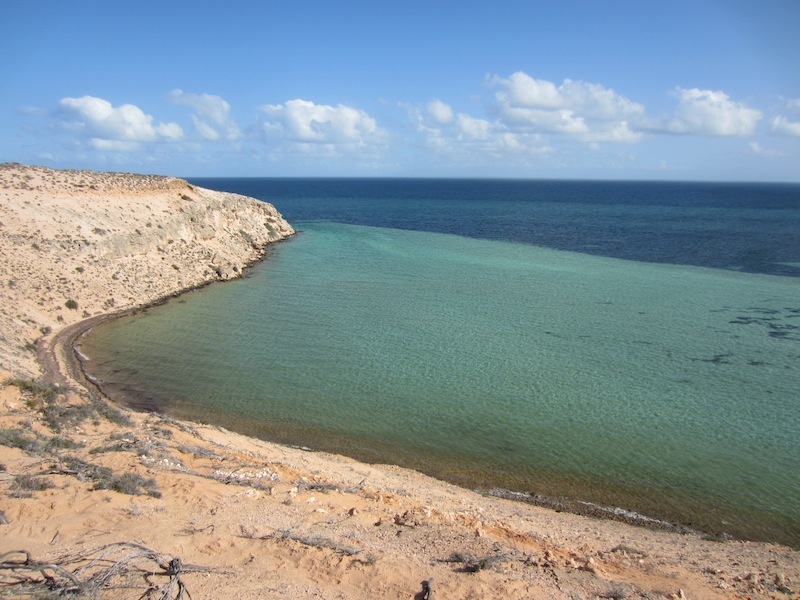 It sits opposite Dirk Hartog Island, the first place that Europeans visited on mainland Australia. Following the arrival of the Dutch in 1616, English explorer William Dampier sailed into Shark Bay in 1699 on his second voyage to Australia, naming the area after the abundance of sharks he saw. The French came next but due to the lack of potable water they showed little interest in raising the Tricolor and claiming the country. Eventually in 1858 the English Captain H.M. Denham arrived and, soon after, sheep farming commenced. The peninsula seems to me to be the most unlikely place to sheep farm as there is not a lot of grass, it’s mostly low scraggy coastal heath shrubs, more like goat country. One striking feature relating to the botany of the peninsula is there are no eucalypts or large native trees. There are introduced woody weeds like Athol pines and palms but no eucalypts. Denham town has a population of around 1500 people. The tourist blurb says Denham is the Gateway to the Dolphins meaning if you want to swim with or feed a dolphin this is the place to come. The dolphin activity happens at Monkey Mia about 26 kilometres east of the town. On the way into Denham we visited Shell Beach, one of only two beaches in the world made up completely of shells, the source of the shell grit under our feet at the caravan park. Walking along water’s edge of the beach crunching shells under foot was an odd experience. This entire beach is small shells, there is no sand at all. In the higher sections of the beach the shells have solidified forming a concrete-like material, which can be cut with saw into blocks. The shell blocks were and still are being used as a building medium in the district. The solidification of the shells comes about by the water-leaching of calcium carbonate from the shells. The solution bonds the shells together forming the dense material. 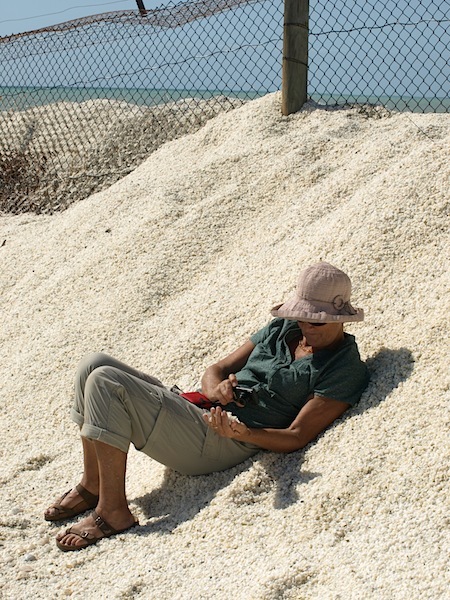 The shells that make up the beach are small cockle (Fragum erugatum) which breed offshore in high salinity waters. At the southern end of Shell Beach is a two metre high electrified feral animal proof fence, designed to keep feral animals such as foxes, cats, dogs and rabbits out of the World Heritage area. 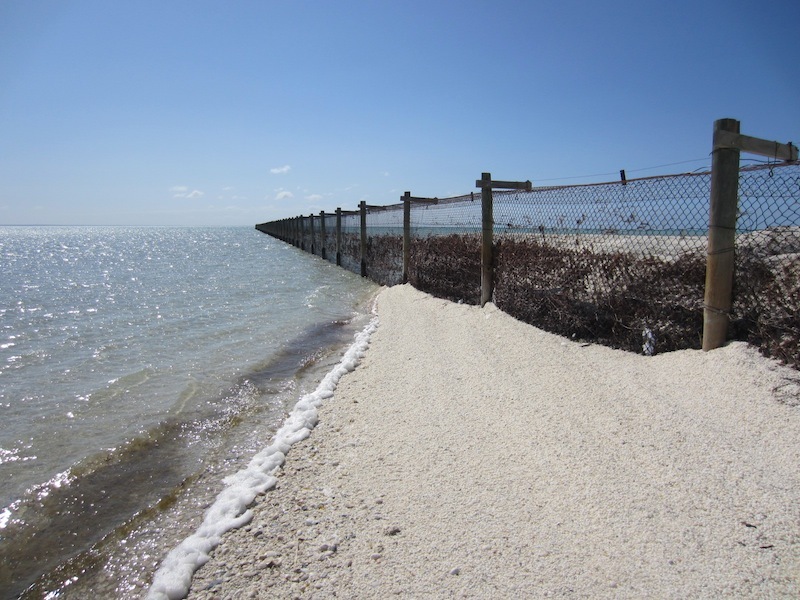 The fence runs well out past low tide mark so there is no chance of ferals getting around the end. Research indicates that since the fence was installed native animal populations have increased significantly. As I was standing by the fence the wind blew my hat off to the other side. I stood looking at my hat in disbelief and decided I wasn’t going to abandon it but how to retrieve it without being zapped was the question. The only way to get over the fence without being zapped was to remove my jeans and lay them across the electric wire then climb over. The difficult part was getting up and over to the horizontal section but with a springing effort I did it without nasty consequences. Bev took a photograph of the event but me in my undies is not a pretty sight. Out of the wind on Shell Beach. 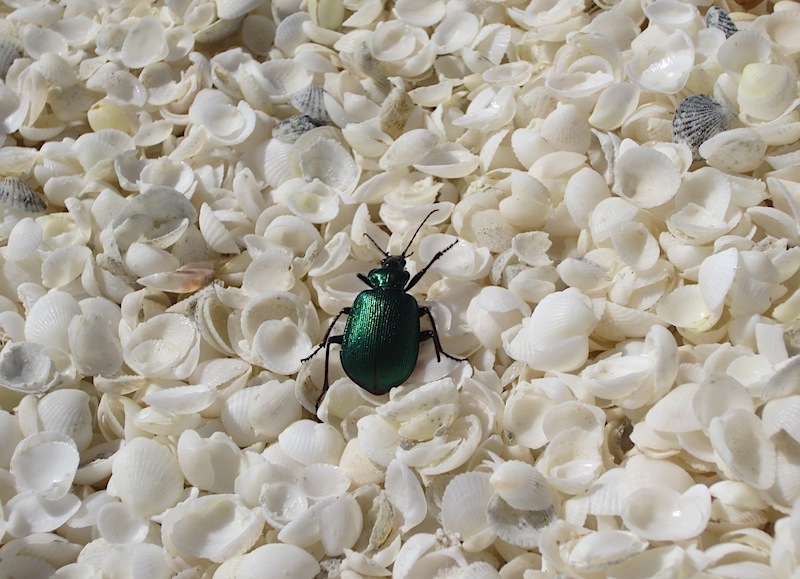 Our entertainment whilst on the beach was watching the beetle attempt to climb an incline of shells. I came to the conclusion that beetles must have very small brains as this one kept falling back. I eventually flicked him to the top of the incline where it promptly turned and headed down again. Another unusual phenomenon relating to the high salinity waters in these parts is the existence of living stromatolites. It is hard to imagine how rocks can be alive but they are. Stromatolites are layered rock forms created by single-cell cyanobacteria microbes of blue-green-algae. 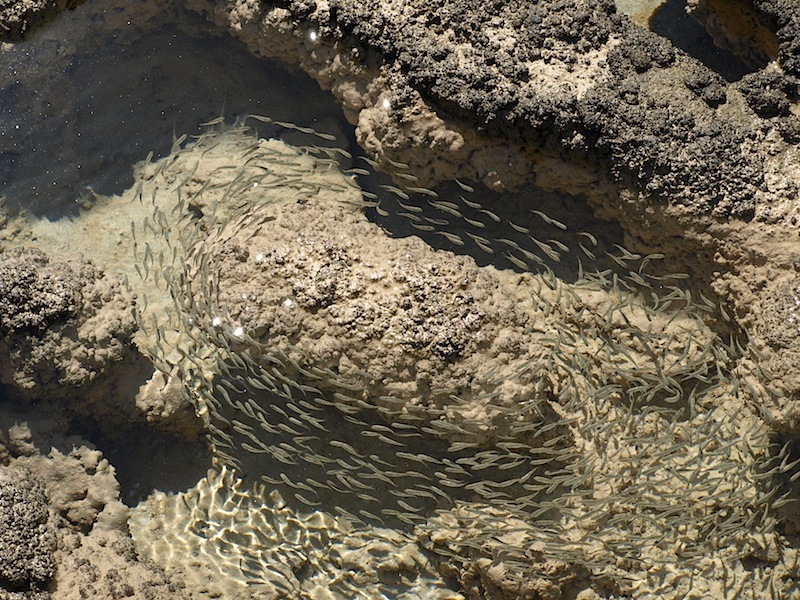 These remarkable creatures form colonies and trap sediment with their sticky surface coatings. 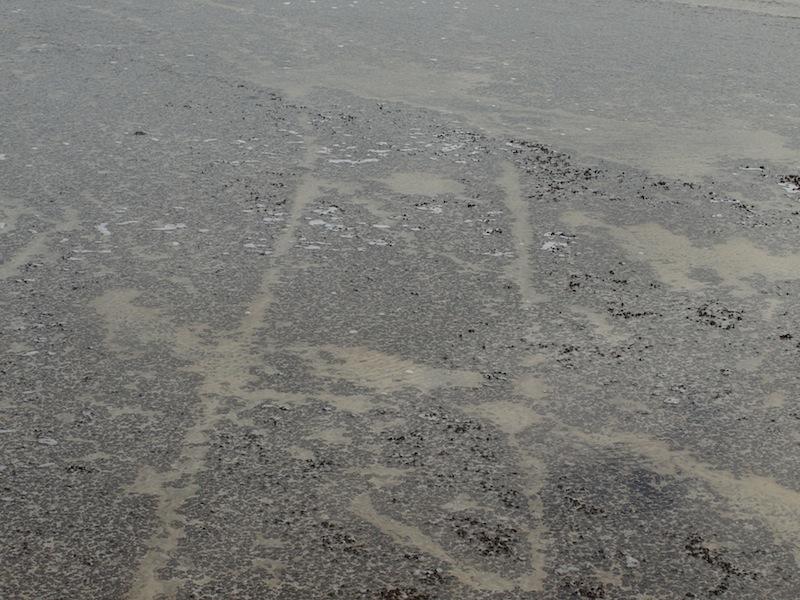 The sediment, mostly made up of limestone, builds up very slowly (50mm growth every 100 years) to form different shapes depending on the depth of water they are growing in. Ones that live in a deep-water location grow into cauliflower shapes whereas shallow water configurations are more mat-like. For stromatolites to live they require saline water, like the fragum erugatum cockle. The question is, how come the waters here are extremely saline? 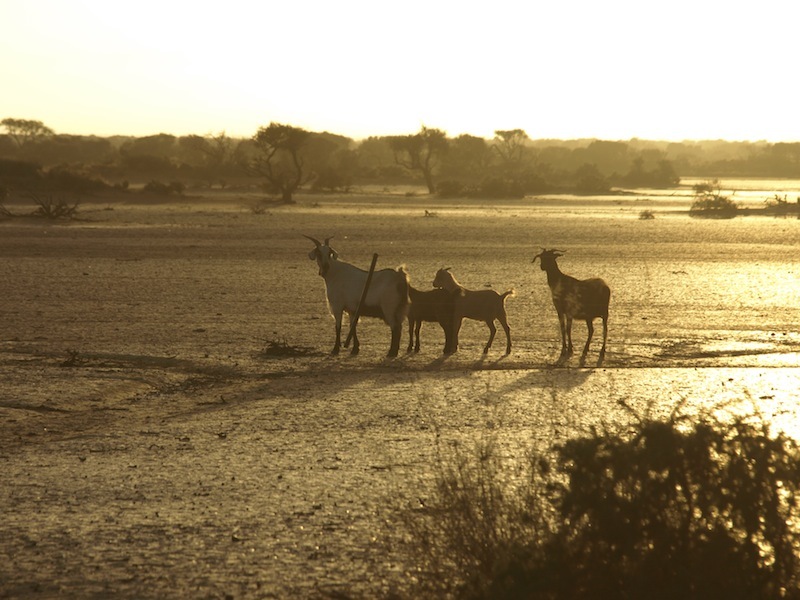 Around 4 000 to 6 000 years ago a massive seagrass bank formed offshore blocking tidal flow onshore and as a result a mass of high saline water now known as Hamelin Pool was formed. The water here is twice as saline as normal seawater. 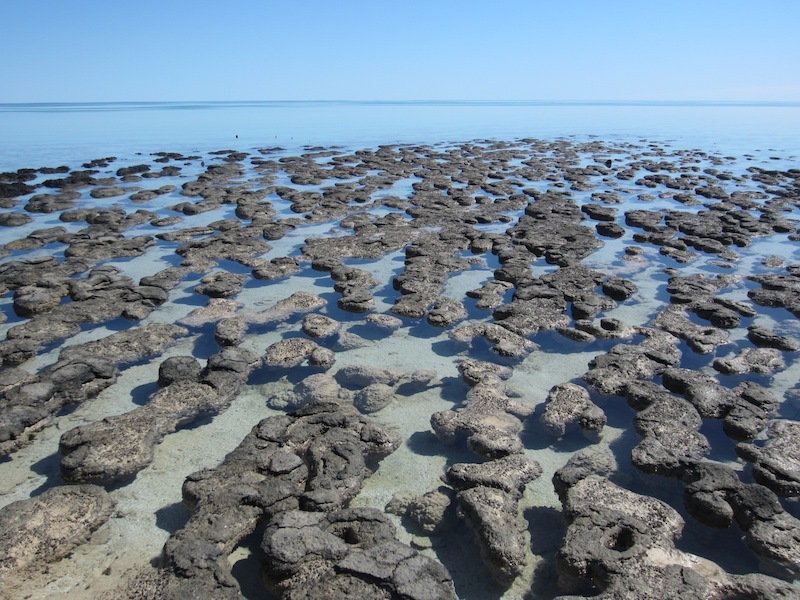 So with the right ecological conditions in place, stromatolites began to form and we can be thankful they did because they are, in fact, plants that photosynthesise their energy from the sun. A by-product of photosynthesis is oxygen and without oxygen there would be no life on the planet. The Hamelin Pool stromatolites have only been around for about 6 000 years but it is their 3.5 billion year old relatives that provided the planet with oxygen. However they didn’t create all the oxygen on the planet as I have read that meteorites when breaking through the earth’s atmosphere dragged oxygen with them. I say three cheers for stromatolites past and present for providing us with our life force oxygen. 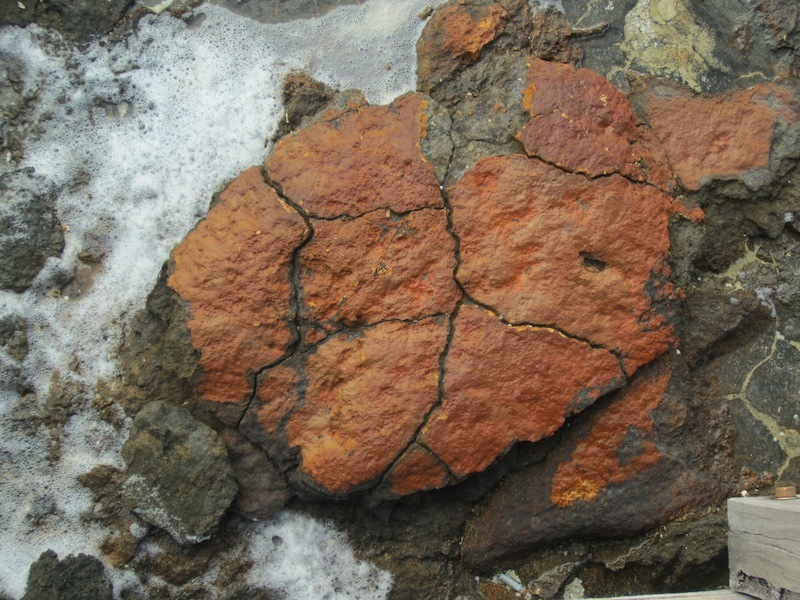 Dead stromatolites stained with iron. After visiting the stromatolites I have come to one conclusion that the ecosystems of our planet are more complicated than our pea minds can comprehend and I can’t understand why we continue to tear it up and destroy it in the quest for more material stuff, half of which we don’t really need. In shallow waters they grow mat-like as in the above photograph. The grooves are wagon wheel tracks. In the late 1800s and early 1900s sheep grazing was carried out in the area and wool bales were taken by wagon down to the water’s edge where they were loaded onto small boats and taken out to a larger vessel which took the load out to an ocean-going ship for transportation to England. 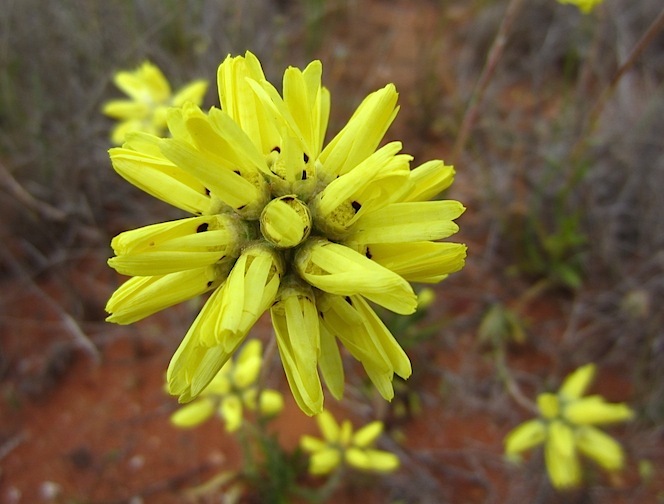 On high country around Hamelin Pool there were a number of rare plants, rare because not a lot of plants grow in shell grit soils. 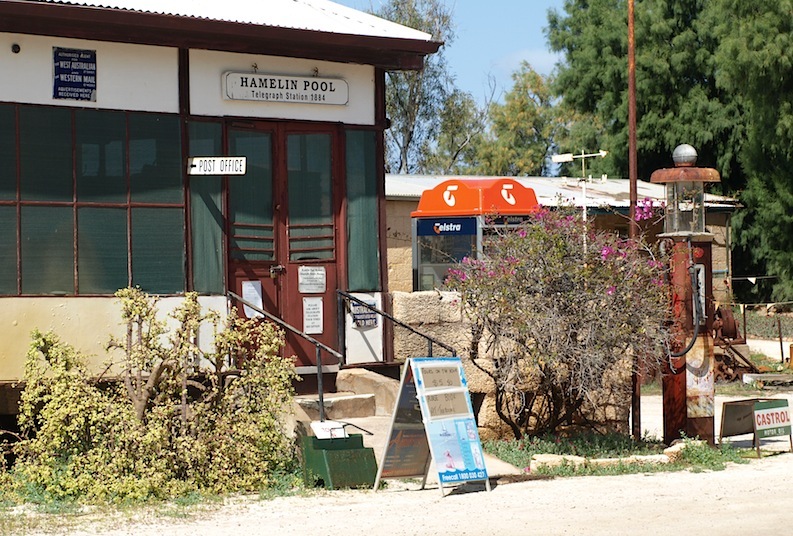 Close to the stromatolites is an old telegraph station converted to an information centre and a cafe made from compacted shell blocks and corrugated iron. 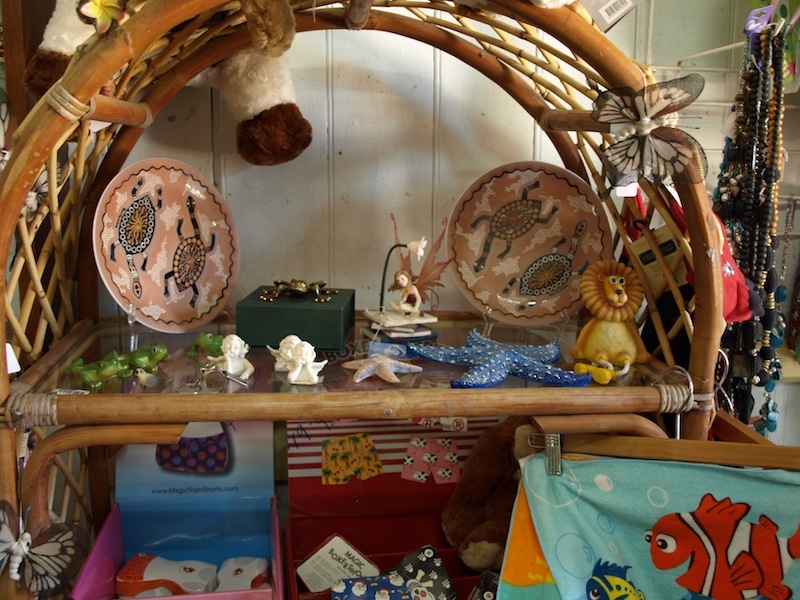 Inside were ornaments, clothes and antique bits and pieces adorning every available space. Bev was amused at the quantity and unusual styles of clothing for sale and I loved the primitive simplicity of the place. It reeked of eccentricity. I much prefer a place like the one there rather than the slick tourist cafes and retail outlets that have proliferated the country. A sign at the entrance said ‘No government money’ meaning all you see is their own work. On the way out from Shark Bay we are going to return to the cafe for pumpkin scones and have another look. 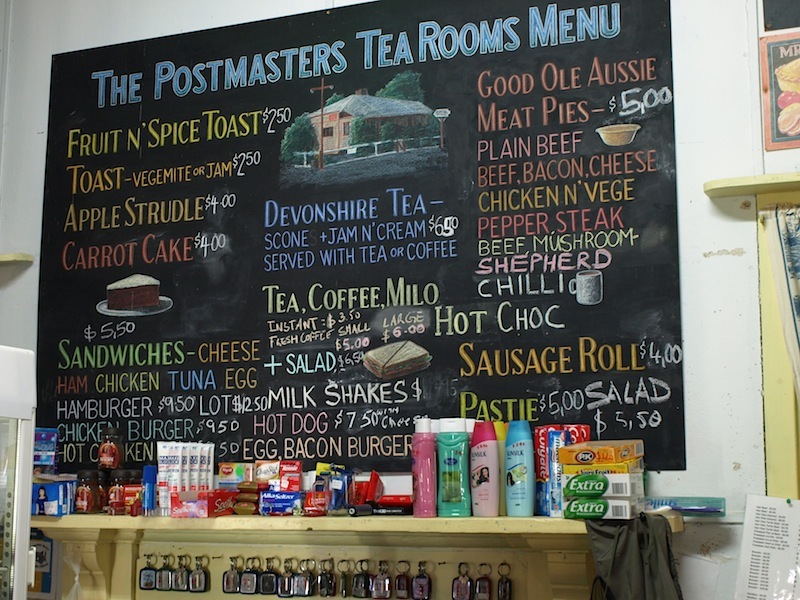 Trish is the owner operator of the Postmaster’s Tea Rooms & Souvenir Shop. The only way to communicate with the outside world. 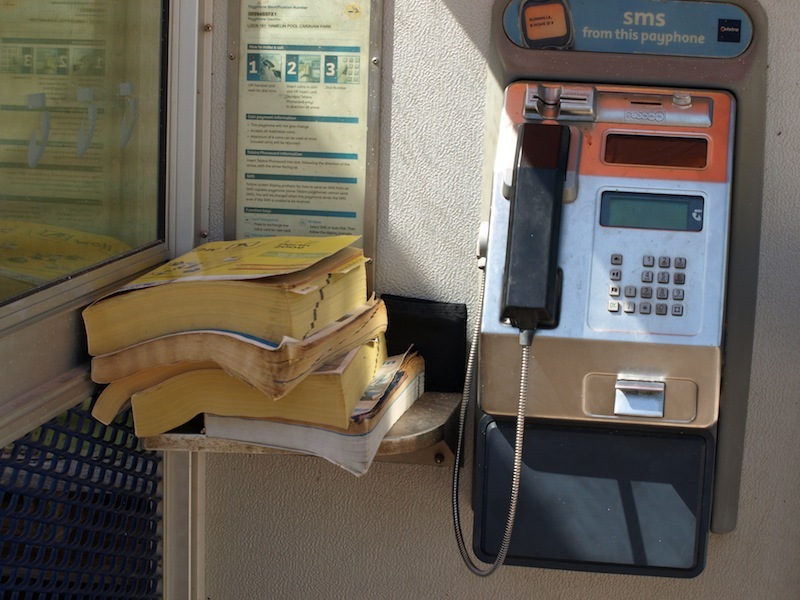 According to the sign it is possible to sms from a payphone. I didn’t know that. Did you? Every post office in Australia had one of these beauties. 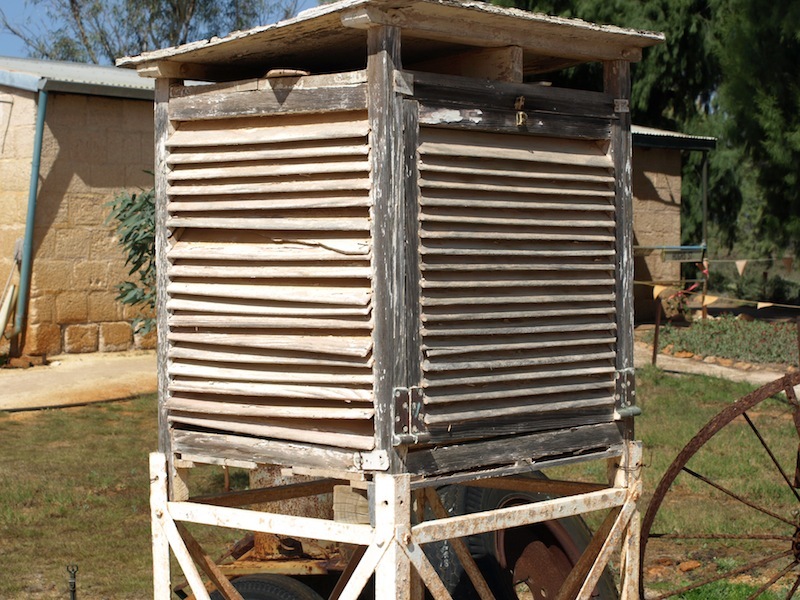 A Stevenson Screen is a well-ventilated wooden box in which delicate instruments used to measure temperature and humidity were housed. In most cases, the postmasters would read and report the readings to the weather bureau at regular intervals throughout the day. For those who don’t know, cossie is an NSW term for swimming costume. The word comes from costume with an ie added. The term for swimming costume varies from state to state in Australia. Other terms include togs, bathers and speedos. The shampoo, sunscreen and chewing gum are crowding the menu a bit, however this is why I like Trish’s place, it’s organised chaos. I also love the chalk work. The whole board is a piece of art work. A Dutch artist, Ben, once said ‘Art is everything, everything is art, art is nothing but a name and a date’. This menu board is exactly what Ben was referring to; maybe it will end up in the National Gallery! Since leaving home on this Odyssey there have been only four down-to-earth commercial establishments I felt comfortable in and they are: the Hungerford Pub on the Queensland NSW border, Fran’s café at Larrimah on the Stuart Highway south of Katherine, Daly Waters Pub where we spent Anzac Day and Trish’s Tea Rooms. Progress and the push for sterility and uniformity are forcing the places with character to extinction. 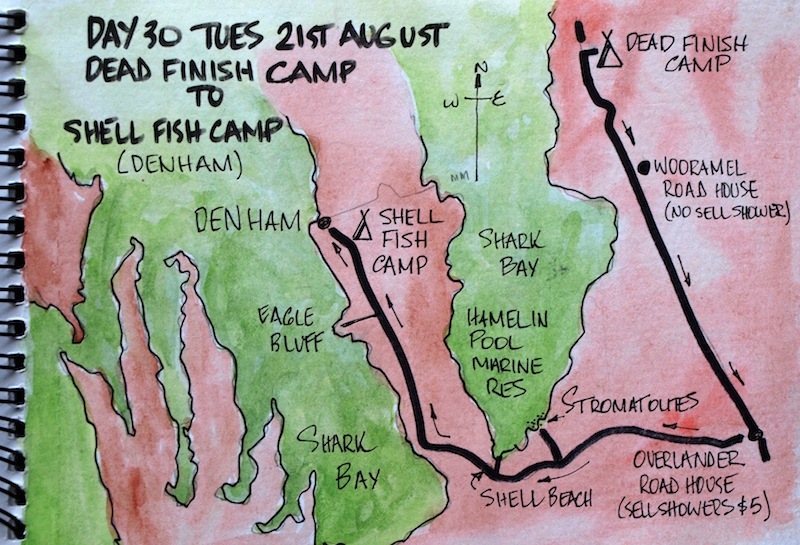 After the telegraph station we pushed on to the coastal town of Denham, where we are now camped. On the way in we took a sidetrack to Eagle Bluff where we had a bird’s eye view of the coastline and islands to the west. About fifty metres below us at the bottom of the cliff was a dugong grazing on seagrass. This part of the WA coast is notoriously windy and today the wind was almost gale force, I guess 40 to 45 kph, and we had trouble standing up. View from Eagle Bluff. Close to the shore, middle of photo, is the dugong. Tonight for the first time on this leg of our journey we have erected a big tarpaulin over our camp as it feels and smells like rain.